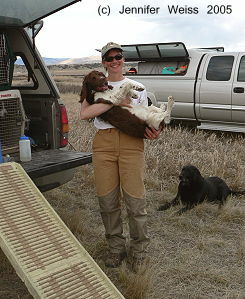 The Missouri Headwaters English Springer Spaniel Club just completed our spring ESS field trial. 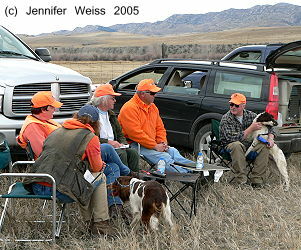 It was held April 2-3, 2005 at the Fish, Wildlife and Parks Fairweather public fishing access site near Three Forks, Montana. Fairweather borders the Missouri River and offers a great variety of springer cover. We had 39 entries in the Open, 31 entries in the Amateur and 9 puppies. There are many elements that make for a good field trial. I would rate the important elements as: good grounds, good birds, good judges, good guns and good organization. I would like to go over each of these elements in the article. First and foremost is proper cover. As we are hunters first, it is and always will be our contention that a spaniel trial should be held in hunting cover. 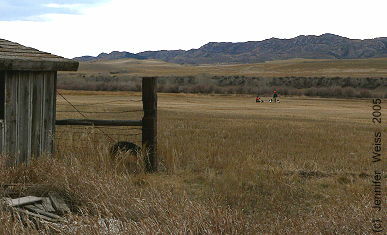 The Missouri river bottom provides exactly the type of cover you would hunt for wild pheasants. We actually must sweep the grounds each morning to move wild pheasants and huns from the trial grounds. This cover consists of a variety of mature cottonwood trees, stubble fields, cattails, brush, buffalo berry, willow jungles and an understory of grass. 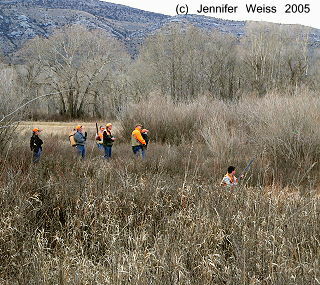 The cover is dense enough to test every dog’s courage and perseverance in finding birds. It also has enough openings to allow handlers and judges to observe the performance of the dogs. 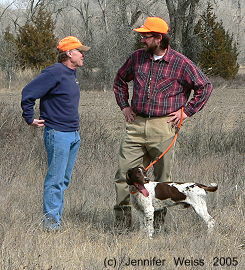 It is dense enough that the handler and dog must perform as a team because many times they are out of visual contact. The variety of trees and dense cover provide a variety of shooting challenges for the gun team. Guns must be able to react safely and quickly to the various opportunities. 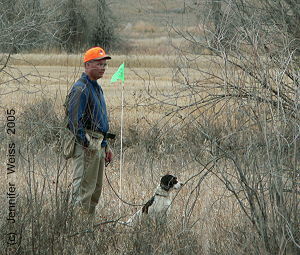 The cover truly can test a dogs marking and retrieving ability with many of the marks close to blind retrieves. We feel this variety of cover is what should be used in testing our spaniels. It offers everything to the dogs and handlers and not just one particular type of knee-high grass. Spring trials and good birds are always a challenge to say the least. Spring birds by their very nature are weak as they are starting to go into mating season. In the past, we used pheasants for our spring trials. They were and are expensive ($11+/bird) and generally poor flyers. Traps were in the 60-70% range. 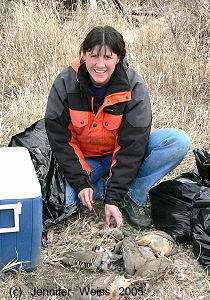 Our spring pheasants never seemed to satisfy anyone: handlers, judges or us. We continued to try to use pheasants because we believe nothing tests a springer better than hard running and hard flying rooster pheasants. Unfortunately, the only birds we know of that provide that kind of performance are WILD roosters in the fall. 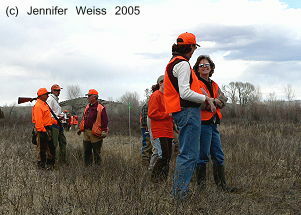 I don’t think Montana Fish, Wildlife, and Parks would allow us to do a trial on truly wild pheasants on public land. We went to a mix of chuckars and pheasants three years ago. 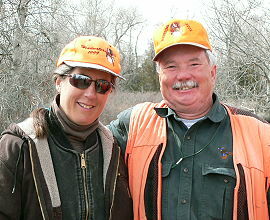 This year, we went to all chuckars for brace work and rooster pheasants for the third series each day. The chuckars were strong flyers and provided some moving bird opportunities. 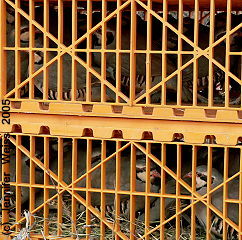 They were outstanding in that over two days we only had four (4) traps in the brace work series. They flew hard, high and long distances. I cannot think of any pen-raised bird that would have worked better on a consistent day in day out basis. "First and foremost is proper cover. As we are hunters first, it is and always will be our contention that a spaniel trial should be held in hunting cover." In our third series, we used rooster pheasants. We agree that a dog must be tested on moving birds. Our contention is that the third series dogs are our best dogs of that day. Now let’s test them on real moving pheasants. The roosters in a creek bottom, bordered by stubble fields, acted very much like wild pheasants. They ran. They hid. They flew. Dogs had to work through dense cattails and willows - making retrieves in both the stubble and the creek bottom. Because of the location, the gallery and judges could observe this action very well. Some of the roosters were produced after trails of over 75 yards though the cover. Many retrieves started in the cover and were finished out across the stubble. One dog had to complete a true blind retrieve across the stubble. It was very exciting to see our best dogs in action. We were very fortunate to have two excellent judges. 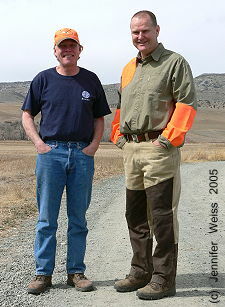 Jeff Miller and Mark Schinderle are hunters, outstanding dog people and gentlemen. They consistently worked with and helped the handlers through many difficult situations. Their experience as hunters first and springer trainers second gave them a firm basis for their decisions. I cannot think of many trials where everyone was as pleased with the judges and their decisions. It was my privilege to work with these two gentlemen throughout the trial. Guns can make or break all the hard work of the trial committee. Good safe gunning is critical to the success of a trial. Our gunners are all hunters and ESS trainers. These men consistently provided good safe gunning. I would like to brag of these guys with tales of 80-yard shots... but I guess no one would believe me. I would rather say that they produced the birds at correct retrieving ranges - consistently and safely. Thank you, gunners: Randy Setzer, Alex Stewart, Kevin Stewart, Wayne Brennan, Tim Eisman, Chris Maxcy, John Wright, and Tim DeGroff. No trial happens by itself. Our club members worked very hard throughout the trial. My job was easy because of them. Unless you have actually put on a trial, start to finish, you have no idea of the work and logistics involved. I would like to thank our bird planters: Heather Maxcy, Scott Benowitz and Tim DeGroff (bird planter and club friend supreme). Without all of these folks there would be no trial. The best thing any trial participant can do is to thank the workers for putting on the event. All too often, the workers are overlooked by the participants. In addition, I would like to thank everyone who participated in our field trial. My job as chairman was extremely easy because of everyone involved: participants, workers, judges and guns. It is always fun to see our ESS in action. 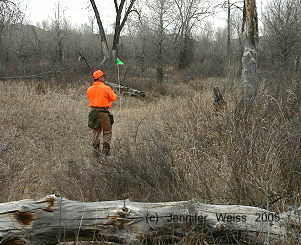 It is even more fun to see them in true hunting situations. I invite anyone to come out to our trial and enjoy our Montana hospitality. You are all welcome. View looking at Missouri River and handlers airing dogs from our base camp. Gunther Boettcher and John Helmuth at base, discussing event. Jeff Miller and Al Carbone discussing a series. Gunner Randy Setzer trying to find a chuckar through the trees. Chris Maxcy and Mesa await their run in third series of the open. Greg Hardy and his son, David, at their first field trial. 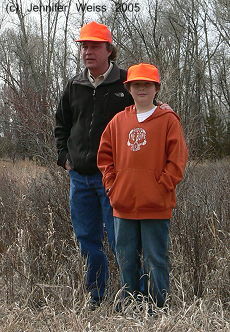 Jack Weiss has been a hunter of upland birds since 1962. During that time he has trained and owned numerous dogs: labs, springers and hounds. 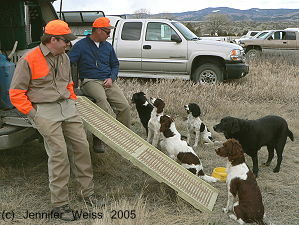 Jack hunts pheasant, ducks, sharptail grouse, sage grouse, spruce grouse, ruffed grouse, chuckars and Hungarian partridge - over 60 days per year with his three springer spaniels. He has trained three ESS to Master hunter levels. Jack competes in field trials, spareingly, and participates in hunt tests on a regular basis. In the past, Jack owned and trained labs for hunting and hunt tests. Jack lives with his wife, Jennifer, their eight cats, 30 chickens and three ESS in Bozeman, Montana. He is also an avid fly-fisherman, casting for trout and saltwater fish such as bonefish and tarpon.